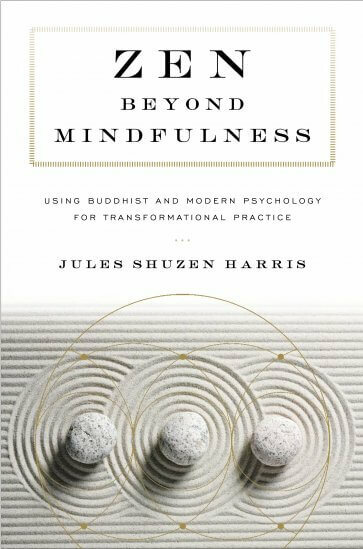 Zen Beyond Mindfulness: Using Buddhist and modern psychology for transformational practice by Jules Shuzen Harris (Shambhala Publications) presents some very intricate Buddhist psychological concepts interwoven with a Western psychological model of Mind Body Bridging. Shuzen Harris is a Zen teacher and dharma heir of Roshi Pat Enkyo O’Hara and a psychotherapist trained in the MBB approach of psychotherapy. In Zen Beyond Mindfulness, he brings together an in-depth exploration of a select set of concepts from the Abhidhamma and the psycho-educational framework of MBB. The approach, ironically, flips the usual East-West weave by setting the Abhidhamma as the cognitive process with the MBB as the body-centered, experiential approach. It takes a moment to see that are the infrastructure of Shuzen Harris’ model. With the glut of Buddhist-W.Psychology integration books, there is a risk that the essence of either or Buddhism or Western psychology becomes a makeover, not a crossover. Zen Beyond Mindfulness manages to avoid the makeover; yet, it perhaps sets up strong boundaries between the two that is not as easily bridged as one would hope. Still, the book offers an interesting start point that is rarely seen in this genre. Suzen Harris’ teachings on the skandhas are insightful, definitively showing them as the formation of consciousness by which we connect with our inner process rather than heaps we should be diving into. Tying in the five common factors, he draws a rich picture of how we relate to the world through our ego, patterns, and desires. Understanding the dynamic of skandhas and common factors is an important system for the beginning practitioner whose impulse in seeking out the Path is to find a way to relate to the external world. Granted, it’s often because we have a misunderstanding that by knowing how we relate to the external world, we can then control that world and by extension, control our reactivities to it. It’s the bugbear of all psychotherapies – and Buddhist practice. Once we enter the six realms, I was wishing we had an interactive map that showed the interactions of the skandhas, common factors, dependent origination, and now, the six realms! However, the book is meant to be read slowly, allowing consolidation of the concepts and not as a “quick give me the answer to my woes!” For the sake of transformation, I appreciated the time Shuzen Harris took with each chapter: laying out the model, showing its connection to fundamental Buddhist teachings, tying it back to the previous models, and moving it forward. Having laid the foundations, we are moved into the Mind Body Bridging model, which in my reading seems to be a way of using the Body Scan with written reflections that explore our assumptions and self-made rules of how the world should serve us. The I(dentity)-System was developed by physician Stanley Block and is intended to uncover that ways the identity we developed to survive developmentally have become obstacles to healthy relationships. The I-System overactivity becomes the cause of our symptoms of distress. The latter half of Zen Beyond Mindfulness is the reflective exercises (many written) that open us to the ways we get in our way. I found it hard to link back to the Buddhist framework so carefully set up, although it is there in the chapters themselves. Experientially, it takes a bit of (non)doing. In Shuzen Harris’ own words, some of the concepts may be artificial delineations of this-that and sometimes those divisions can be misleading for readers less familiar with Buddhism’s core foundation of emptiness/sunyata. I can certainly recommend the book for practitioners (zen or not) who want to spend some introspective time exploring their edges. However, the words “beyond mindfulness” beg the question of anything being “beyond” in the Buddhist worldview – except just plain going beyond. Svaha! I’m willing to consider reviewing books that are in line with the theme of this blog. Books about mindfulness, Buddhist practice, compassion, or mental health are welcome. I do not review books that promote violence, racism or make unsubstantiated claims about the Power of X. But I do run out of firestarters for the wood stove, so thank you for that. Please be generous. If I review your book, pass it on in your social media. Even if I didn’t like your book. It’s your chance to write a better review. Please use my correct name when contacting me: Lynette. Depending on how we may know each other Dhammaji, Chân Diệu Thi or Genju are all acceptable. Not Lynn, Lynne, Lyn, Lime, Lise, Linet, or any of the 108 variations available. Note bene: This book was received from the publisher for review. The Day the Buddha Woke Up by Andrea Miller is a surprisingly delicate presentation of a story every Buddhist has heard over and over. (I was about to write that it is a story Buddhists have heard but I wonder if we’ve ever really heard the story.) I knew Miller’s book was a board book when I agreed to review it, despite reservations about a genre I associate with my daughter’s early bedtime stories or – more often – her early attempts at training as a pitcher for the Blue Jays baseball team! I was tentative. Miller is an editor at Lion’s Roar and the author of what seems to be a delightful book, My First Book of Canadian Birds, and lives in Nova Scotia. One does not simply walk into a book review of an editor with these chops though I feel a bit more reassured now as I write this. The story of the Buddha’s life from birth to enlightenment is told in simple words accompanied by rich and incredibly textured illustrations that form the container of the script. From the sweet drawing of the baby-to-be-Buddha held in maternal arms to his journey through ascetic practices, from the sadness of home-leaving to sitting down under a tree, the story fills out and overflows into your imagination. Sometimes, I think we read things with too many words. This little book can be enough. Disclosure: I was asked to review the book by its publicist. 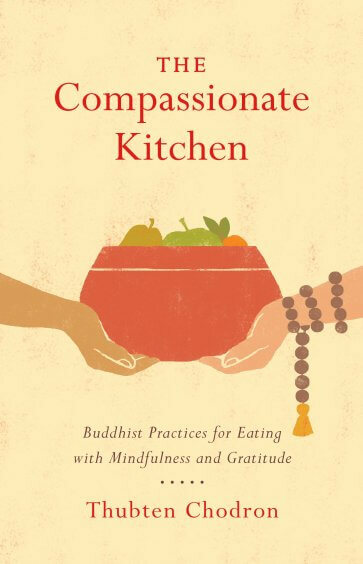 The Compassionate Kitchen: Buddhist practices for eating with mindfulness and gratitude by Thubten Chodron (Shambhala Publications) is a gentle, paced exploration of how to approach a very central aspect of our lives. It’s not the typical book on mindful eating, crammed with cheery ways of looking at food and upbeat approaches to savouring every morsel. I was relieved. The truth about food is that it can be a tormenting dance at least six times a day with a lover we can’t be rid of or negotiate piece treaties. Having been on a few – many – a lot! – of diets and deprivations, I can absolutely attest to the reality that food and I cannot live with or without each other. Reading Thubten Chodron’s very disciplined yet gentle approach to exploring the intricacies of nourishing ourselves, I think I’ve had it all wrong. It’s not about the food. Well, it’s not ONLY about the food. It’s about the intimacy with which we approach the whole relationship of being with each other. While she opens with a generous portion of life at Sravasti Abbey and the title of the first chapter can seem daunting (Eating as Spiritual Practice), the theme is clear. See and know the net that gathers for you what you need to live. And that’s not just food. The motivation we bring to each action impacts its results, and eating is no exception. Attachment makes our mind very narrow and self-centered: a mind filled with craving has no room for generosity. Throughout the book, Thubten Chodron offers this refrain, which I have always held as the core of practice. In this age of quick-fix mindfulness, it’s an important foundation for practice. Our intention sets the tone for our path, yet it is a fragile vow given to being swept off in the torrent of negative emotions. The value of the teachings in this book is the constant reminders to return and refresh our motivations of awareness and kindness. Most cultures treasure eating not only for its sensual pleasure but also because people bond by sharing food together. By nourishing each other with food and human connection, life continues. The chants offered in the book are an interesting part of practice. In every Zen center I’ve practiced, it was my favourite time – perhaps only because it meant good stuff was about to happen! The chants in this book are more elaborate and expansive, yet they have a soothing quality that opens the heart and relaxes the craving mind. I admit, after trying a few chants, it seemed to require more dedication than I have at the moment. Still, I do believe that recitation together at a meal can have a positive impact. The sharing of our lives is more than happenstance and we quickly forget why we came together. Communal recitations of any kind can remind and refresh our intention for being together. Chapter 10 is likely the most powerful and I sense a wisdom in walking us through the principles and practices of food as a relational process before bringing it home in this poignant and powerful way. In the chapter, community members write about their relationship to food and their words are both painful and reassuring. Overall, I enjoyed having the chance to shift my vision of food and the roots of my relationship to it. What came as a surprise though was the realization of the “kitchen” as this flesh body, this world, these relationships we have with each other. For that I am most grateful. Disclosure: I received the book for a fair, unbiased review. However, I actually bought it for myself because I was too impatient to read it. I met Gary Gach (I think) a few years ago (I think). Or maybe he and I met on Facebook after I met someone he knew who knew someone I didn’t know… All of which to say, I appreciated the chance to read this book. Pause, Breathe, Smile (PBS) sets a high bar for itself. “Awakening mindfulness when meditation is not enough” throws the gantlet down at the feet of the infatuation with meditation. This an important understanding: meditation is not many things we want it to be and it is not enough. When that becomes apparent, most practitioners give up and find another escape or addiction. Gach is not afraid to confront this head on. If you want to experience changes in your life, you have to be willing to take the show on the road. And Gach offers a terrific framework for getting traction on the path to liberation: Intentionality (pausing), Introspection (breathing), and Insight/clarity (smiling). It may take a moment’s breath to pause and stop chafing against the seemingly random connections between the words and definitions. But hang in; it does make sense. 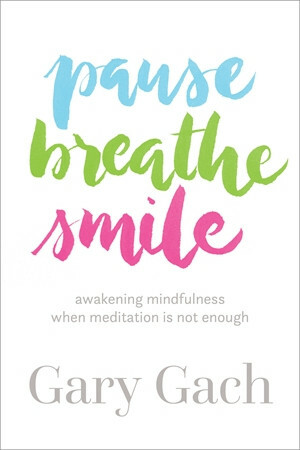 Gach, ordained in the tradition of Thich Nhat Hanh, makes a quick deep dive into the heart of mindfulness practice: discipline leads to mastery. Using the fundamental practices taught by Zen master, Thich Nhat Hanh, he outlines the daily, continuous practices of attending in the life we live: mindfulness bells, mindfulness blessings, mindfulness trainings, and the triad of study, observe, practice. This is no sweet-talking, do-what-feels-good approach (well, maybe there’s a sweetness in the invitational tone which is irresistible). Rarely found in today’s deluge of mindfulness books, however, is the courage to address the core of mindfulness practice: cultivating a moral life or what is called “living by vow”. Gach doesn’t shy away from this. In “A moral perspective” he lays out the arc of mindfulness as a relational process. Being a good person…can be one of the most valuable gifts we can offer ourselves and others. Studying our lives, observing the consequences of our actions, and iterating through practices makes our aim more true in becoming human, more compassionate. Gach offers the Five Mindfulness Trainings, the lay vows taken by Buddhist practitioners and reframed by Thich Nhat Hanh to be more prescriptive than proscriptive, as a means of setting the frame for practice accessible to anyone regardless of religious or personal beliefs. It’s like gazing down at a clear stream bed, when, unexpectedly, a little leaf falls upon the surface and then whoosh! whoosh zooms away. The leaf surprises us by showing how swiftly a current has been flowing invisibly. So too can our mind race like the wind, without our realizing it. Through Smile, he explores the practice of equanimity and patience. I’ll admit I had trouble with the suggestion to “smile (as acceptance) when it’s 100 degrees! (I always chuckle when someone says “It is what it is.” One of my teachers used to retort: It is not IT!) Wisdom practices are the most challenging because they require perspective-taking and relinquishing “truths” we hold dear. Using the ideogram of wisdom that contains the scripts of heart/mind and a hand holding a broom, he explores how practice is the process of sweeping clean, purifying our hearts.